Hello, with a new set on the horizon I thought I’d forget about standard since everyone is talking about it, and have a look at modern. My local store recently ran a Modern FNM as opposed to standard, so I’d like to share my deck and experience of it with you. 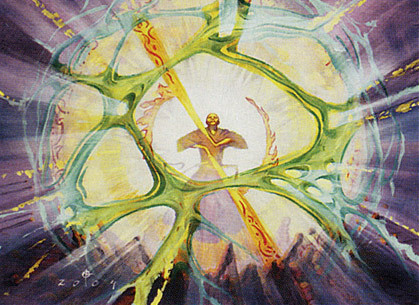 The reason I wanted the deck to feel more like RUG Delver from Legacy, is I enjoyed the pressure it applies early on, and the tools it has to keep other decks at bay. With a lot of combo in modern, this felt like a good angle. Kird Ape is a straight up swap for Nimble Mongoose, obviously not as good as the Mongoose, it does beat for two right from the off, and I chose the three toughness over the haste of the Goblin Guide. Being killed by Snapcaster Mages being flashed in felt bad and just being that little more resilient seemed advisable in a relatively threat light deck. Eight cantrip filter spells were replaced by eight worse cantrips, but these are still decent cards and one of them can set up Delver nicely; these dig spells really make the deck tick. Without having access to Daze, Stifle and Force of Will, I found room for Snapcaster Mage, and a couple of Ninja of the Deep Hours made it into the list; Snapcaster doesn’t need explaining, but the Ninja probably does. Once upon a time, the Ninja was pretty decent in Legacy, bouncing things like Spellstutter Sprite and getting value, here is bounces Snapcaster Mage. Also, with eight one drop beaters, it’s often able to get in your Ninja on turn two and start drawing a lot of cards, sometimes you get to bounce a guy in response to removal. He had a lot of pros and is a card I enjoy very much, I had the slot and he made it in over the Gigadrowse. Wasteland is another when ported to Modern from Legacy, and with the loss of Stifle as well, I felt land destruction wasn’t good and the only ones available were not efficient enough, so I did what any self-respecting player would do, jam in the best four colourless lands out there. They don’t come much better than Mutavault which is very solid for a tempo deck looking to clock fast. With less reliable counters, Vapor Snag and more burn spells made it in to cope with creatures. As we know, Snag is very good in tempo decks, and burn can help clear the way or finish them off, and works exceedingly well when you get double reach from it thanks to Snapcaster. Remand was then the logical choice for a counterspell, giving you a cantrip and a tempo play, this deck felt like it would always have a decent amount of cards in hand. Spell Pierce appeared to be a fine card to transport over to Modern, with a lot of combo decks and many key non-creature spells in most decks, being able to crush a three mana spell for one was a feeling I wanted to have often. Manabase wise, I wanted some basics which is a deviation from Legacy builds, but the damage from shocklands was not something I always wanted to take, and Blood Moon is very much a real card in modern. It’s all pretty simple, some extra Snags and a Pillar to deal with creature decks, obvious cards for other match ups and Dispel which is great against Storm and control decks, once again crushing plays for just one mana. Game one; I knew he was on storm, and he suspended a Lotus Bloom on turn one. I made a guy and started coming in for damage. My hand had just the Remand to control him, but a little bit of dig which I felt was worth it. I was however, stuck on two lands, and when my third land came after Remanding his Lotus Bloom to buy a turn, it was a forest and meant I couldn’t dig and counter that turn if I were to find a counterspell. I held out for a turn and found another remand, but by this point he had enough mana to play around my Remand and fetch up some massive winged beasties. Game two; I was pretty happy since my deck has a lot of anti-storm cards post board. I made some pressure, he didn’t play a second land and Serum Visioned two cards onto the bottom. I was pretty happy I could make some more pressure this turn, including a Ninja to dig more, and not die in his turn unless his hand was Desperate Ritual, Seething Song, Seething Song, Seething Song, Dragonstorm or two more rituals over a Song, and he still had to draw a land. So I tapped out, he drew a land off the top and trip Seething Songed me out of the game next turn. It was annoying, and I think I’d make the same call again if it came to it, perhaps I should have mulled into Spell Pierce for game one though. Game one; I knew he was running the Past in Flames and Pyromancer’s Ascension storm build. I kept a pretty decent hand, and made some Delvers early on, then sat back on the counterspells, my pressure meant he was in trouble, but I had counterspells to keep him pinned back and he never got a window to combo. Game two; with my sideboard it was going to be much better, but I knew he could be boarding into twin, so I had to play around it. I stuck a turn two Ninja who started drawing me all the goods. I had a fair amount of mana so I could afford to Remand his end of turn Vendillion Clique and still have counters up in his turn. I drew into a Mindbreak Trap, and Remanded his Clique again. I now had more pressure on board to go with it and was discard each turn due to having so many cards. I passed the turn with two Mindbreak Traps, a Spell Pierce, and a Snappy in hand. Turns out he had boarded into twin but couldn’t get there. Game one; suffice to say, this deck surprised me. 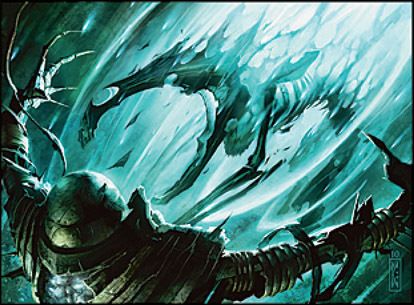 He was running Enduring Ideal to win with Form of the Dragon, making it uncounterable with Boseiju, Who Shelters All, with a fair amount of ramp as well as Sundering Titan to reanimate thanks to Faithless Looting and Trash for Treasure. It took me a while to understand what was happening, I was clocking fast, but he cast Phyrexian Unlike which effectively gained him ten life which was too much. I Remanded his Sundering Titan, but next turn his Enduring Ideal found him a Form of the Dragon, so he was gaining more life than I could hit him for since he effectively was preventing the first five damage I dealt every turn. Game two; I made some pressure and got in with the Ninja. I was able to stifle everything he did with counterspells and my clock was fast enough to get him before he could really do much. Game three; I had Ninja and pressure and kept his early plays down, but he did manage to force through an uncounterable Enduring Ideal. He got Form of the dragon, so he began to clock me. I had a Delver on board as a 1/1 and a Lightning Bolt in hand, so I had ways out, but I had stupidly used my Snapcaster Mage unnecessarily to Remand from the graveyard instead of from my hand, which gave my opponent an out so I couldn’t just double bolt him. I had a lot of Remands this game, so all his other Enduring Ideals were going to be countered, I just needed to flip my Delver or draw a Snapcaster mage. My opponent should have used Form of the Dragon to kill my Delver, but instead clocked me, this mistake allowed me to flip Delver and win with the bolt. His mistake effectively counteracted mine. Game one; I had no burn spells, but some counterspells and a clock. I finally resolved a Cloudstone Curio and a little bit before my clock became lethal, he went off, my Remand was pretty ineffectual and he drew his deck, Manamorphosed some red mana and Grapeshot me for a somewhat large amount. Game two; his storm win was looking less good, but I knew he had some counterspell protection, my Vapor Snags to disrupt his chain and burn spells here also seemed good. He came out the gates early, and made an early Summoner’s Pact after he saw me miss my third land drop. However I untapped and bounced his Elvish Archdruid and burned his Heritage Druid so he couldn’t pay for Pact and lost in his upkeep. Game three; I flipped a Delver and began to attack. I burned his Heritage Druid, which he then got back with Eternal Witness, so I hardcast a Mindbreak Trap to exile his Heritage druid when he cast it. That put him mildly on tilt, and also gave the impression I had a second Mindbreak Trap in hand, when really I just had some other counters and a freshly drawn Ancient Grudge for his Cloudstone Curio which had helped gain him a bunch of life from Essence Warden. He had to then trade his Witness for my Mutavault but then tapped out to make a Heritage Druid and guys, I then untapped and slow rolled him, swinging for three to put him on one, I Forked Bolt his Essence Warden and Druid. Then Bolted his Archdruid, followed up by Snapcastering back my Forked bolt to kill another dude and him. That was the last round, so I was pretty happy with my results, as my loss felt pretty unfortunate indeed and I’d happily play against that deck all day long with this list. The first thing to go is going to be the forest, it felt like a really bad draw every time; I’d rather have another Breeding Pool. The Ninja performed really well, there were quite a lot of cards to be drawn from him over the tournament and I’m sure I missed out one of the times I cast him in my report somewhere. Kird Ape did a fine job as a beat stick, and Mutavault allowed me to clock more efficiently against combo decks, Tarmogoyf was strangely weak, he still did damage and was fine, but costing two and sometimes being an expensive Kird Ape was interesting, not to the point where I’d cut him since he’s so valuable against other creature decks. The manabase was fine, aside from the point already made, and the cantrips really made everything tick nicely. 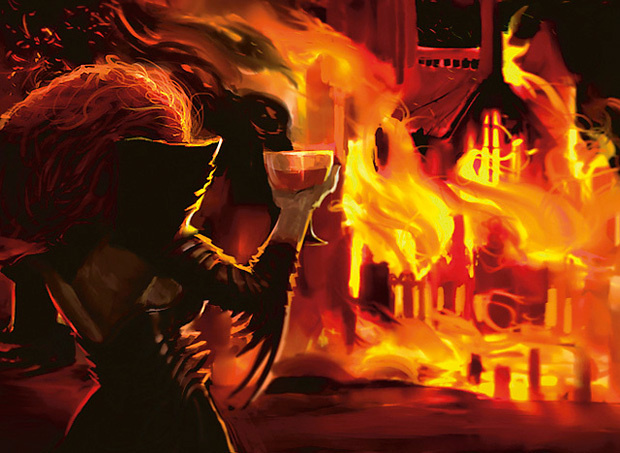 Sideboard wise I want an Echoing Truth or two to help beat random stuff and Empty the Warrens as well as the usual tweaks for less specific metagames. Number wise, for different events you could tweak the Snag, Pierce and Burn spell count I think, but generally, the deck ran smoothly and it did feel a lot like my RUG Delver deck in Legacy. I’m sure if I put the testing in, I’d be happy to bring it to a PTQ once tuned a little more. Next time; I think it’s been too long since I’ve discussed a Team Italia deck, so I’ll build one for modern and share it with you.